Shop ChargePlus, GREENUL & GREEN6! TRI-BORO THE SOURCE ALSO FROM TRI-BORO: • STEEL SHELVING • SHOP FURNITURE • SERVICE CARTS • PERF DECK ASK FOR OUR NEW CATALOG! 22 |	 Human Element Caliper Corp. Should I hire this person? It’s not the company. It’s the people in the company. It’s you! Is your business ordinary, average or upper quartile? MHEDA sets the stage for What's Next at their annual Convention and Exhibitor Showcase. 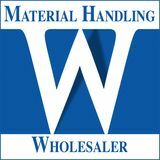 Wholesaler will let you know the details so you can plan ahead for networking and education sessions. GRINDSTAFF Engines Inc. NEW ENGINES AVAILABLE & IN STOCK NOW! Cantilever Racks • Structural Pallet Racks Portable Stacking Racks Specialty Transport & Storage Products West Point Rack is one of the fastest growing companies in the industry. Our customers recognize quality products, dependability of service and competitive pricing. Our Primary Goal is to support our dealers, satisfy their customers, earn trust and be the “Vendor of Choice” for rack products and racking systems. We offer a full line of light duty, intermediate duty, heavy and extra heavy duty cantilever racks. We provide multiple configurations of a wide variety of stacking racks. Our structural pallet racks can be configured for a wide range of applications. West Point Rack h as the products that generates solutions for your storage needs. We also offer specialty products such as bar cradle trucks, drum racks, hand carts and other specialty transport and storage products. Give us a call at 866.245.3630. We may have what you need. Look forward to hearing from you. CONTACT US TODAY! Lift Truck Nation is a premier used equipment provider, selling material handling equipment, services and solutions across the United States and headquartered in Atlanta, Georgia. We specialize in reconditioning used forklifts of any brand and condition. Whether you are looking to buy a used piece of equipment or looking to sell your used equipment Lift Truck Nation is your one stop solution. Cover Story Sopher, the principal with Deloitte Consulting LLP’s Supply Chain practice will join George W. Prest, CEO of MHI in presenting the findings and moderating a panel of manufacturing and supply chain leaders on the report’s findings. They will be joined by a panel of manufacturing and supply chain professionals to discuss the real-world significance of the report findings. Wednesday, April 10th 1:00—2:00 PM  arcus Lemonis, CNBC’s “The M Profit” / CEO, Camping World / Serial Entrepreneur  he Three Keys to Business Success – T People, Process, Profit As a self-made billionaire, Marcus Lemonis has seen his fair share of companies come and go on his hit CNBC reality series, “The Profit.” Don’t miss this opportunity to take advantage of his knowledge and insight as Lemonis shares his secrets to business success. Wednesday, April 10th 4:30—7:00 PM Craig Ferguson, Comedian & Actor  HI Industry Night with Craig M Ferguson Grand Ballroom S100 Join us for live music, food, drinks and entertainment by comedian Craig Ferguson. Tickets are $50 and include beer, wine and hors d’oevres. Scottish-American actor and comedian Craig Ferguson is best known as the host of the CBS late-night talk show The Late Late Show with Craig Ferguson. He also appeared on The Drew Carey Show and was the host of both the syndicated game show Celebrity Name Game, for which he has won two Daytime Emmy Awards, and Join or Die with Craig Ferguson on the History Channel. INTERNATIONAL VISITORS ProMat attracts visitors from over 115 countries. As an international visitor to ProMat 2019, a number of services will be available to you at the ProMat International Visitors Center to make your visit a more productive and rewarding experience. 2019 SHOW HOURS Monday, April 8, 10:00 am – 5:00 pm Tuesday, April 9, 10:00 am – 5:00 pm Wednesday, April 10, 10:00 am – 5:00 pm Thursday, April 11, 10:00 am – 3:00 pm SHOW REGISTRATION There is no cost to attend the show or educational seminars. 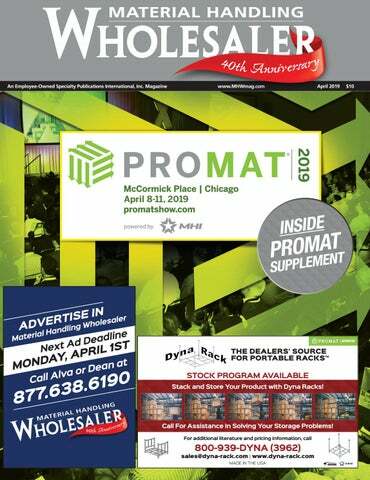 Visit www.promatshow.com to register. TIRED OF UNPROFITABLE PM’S? IT DOESN’T HAVE TO BE THIS WAY. CALL ME FOR STRATEGIES ON HOW TO STOP THE PM PRICE WAR! diverse intergenerational workforce? Not everyone is a millennial, and we want a broad enough program to engender participation from everyone. If you give someone a story to tell, they may just tell it! If your dealership is highlighting a product, and hanging a reward on it, you will have much more success if you educate the people selling it on the compelling reasons why a customer may want to buy it. This addresses the “WHY” we discussed earlier. It they want to know WHY, let’s tell them! •P  rograms must have adequate INVENTORY Nothing kills an incentive program like NOT HAVING THE ITEM. Your employees will actually ridicule the management for their lack of planning and any traction you established early on will disappear. Programs must be internally advertised If you don’t talk about it, why should you expect them to? Banners, leaderboards, paycheck stuffers, blast emails….just keep the communication going. Your employees are watching you….they will only be as excited as YOU are about the program. rewards just for the idea generators among you. We even offered shop techs rewards based on completing jobs under the quoted hour allowance. Whatever you do….make it fun, talk it up, and pay it often. Dave Baiocchi is the president of Resonant Dealer Services LLC. He has spent 37 years in the equipment business as a sales manager, aftermarket director and dealer principal. Dave now consults with dealerships nationwide to establish and enhance best practices, especially in the area of aftermarket development and performance. E-mail editorial@mhwmag.com to contact Dave. Stop by booth #S5138 at ProMat and learn more about TVH. Is your business ordinary, average or upper quartile? How is the business doing? What do you say when someone asks, “How did 2018 come out”? And if you say we did this or this happened and they ask “Why” that happened, do you know the answer? I unfortunately believe that a large percentage of CEO’s could not answer that question knowing exactly what happened. not sure your management team knows it any better and want to step up their game, but at the same time want to insure they will get a bank for their buck. I would expect that type of response from one of the run-of-the-mill equipment dealers that put forth the AVERAGE numbers we find in the annual financial reports covering the industry. You know how some of those reports work…. we have the upper quartile (top 25%) and in some cases the lower quartile (lowest 25%) and then everybody else. YOU must lead the charge. YOU must attend EVERY program or meeting. YOU must involve your CFO and other DEPT HEADS. This is the only way you will know where you need to be and can discuss these changes with other executives who have been through a program resulting in better operating income and cash flow. GUESS WHAT? A BUSINESS CANNOT AFFORD TO BE “EVERYBODY ELSE” IN THIS DAY AND AGE, AND DON’T HAVE TO BE WHEN THERE IS SO MUCH HELP AVAILABLE TO MOVE THEM INTO THE UPPER QUARTILE. IF YOU CANNOT COMMIT TO THIS TIME OBLIGATION …. SELL THE COMPANY. Well, we can get you there but there is one very important segment of the program that only you, Mr. CEO, can accomplish. Can you guess what that is? And the answer is. If you believe I am being a little harsh here I don’t believe I am. Because if the CEO is not leading the effort the company will never reach the improvement levels needed to make the company more financially viable. Here are some steps you can take to get on the right track. • Join MHEDA and actively participate in the DiSC Report (that means submit your data on an annual basis). If you cannot do this on a timely basis you are in big trouble. •P  articipate in MHEDA convention and programs. Talk to other attendees. Meet with your OEMS and ask for their assessment of your operation compared to the upper quartile firms. Record the conversations or take notes. •T  ake your CFO along to these meetings and discuss info and data you would like to start seeing on a monthly basis that will help you improve operating results. •Y  ou and your department heads should attend MHEDA programs addressing parts, service, rental, sales and other meaningful topics. Bottom Line •R  ead this publication and others like it. There is a ton of good free information to consider. And don’t hesitate to give the authors a call if you have questions. We love talking with you. •M  ake it a point to review other dealer-oriented industries …. construction equipment dealers, rental companies, leasing companies, auto dealers and whoever else you can find. I guarantee you will learn something you can apply to your business when you do. Ok, that is Phase 1. The time commitment is a must and the cost are reasonable. The next step up is to join one of the 20 Groups presented by Bob Currie or Walter McDonald. Same time commitment for three twoday meetings per year where you will have to provide quarterly financial data which is compared to others in the group. You are also expected to ACTIVELY PARTICIPATE IN THE DISCUSSIONS AND SHARE PERSONAL RESULTS AND IMPROVEMENTS WITH THE GROUP. You could also be called upon to produce new ideas to the group at each meeting, most of which are viable options to consider. The BOTTOM LINE here is that if you don’t fully cover the cost the meeting by the end of Day 1 you are not paying attention. Side Note: Walter McDonald put together a set of his training materials in a two or three volume set you can get on Amazon. Cost is very reasonable. I have personally witnessed and participated and monitored some of these group meetings and can attest that the CEO’s attend each meeting, actively participate in the discussions and put a lot of effort into the “new Ideas” segment of the program. How amazing is it that all the companies represented by these attendees are in the Upper Quartile regarding financial results? Hmmmm. Stock using a divider to separate a reserve quantity. Pick until main inventory runs out. Flip bin to access reserve stock. Trigger automatic refill alert with the bin color change. To find out more about how Akro-Mils products can help you manage your inventory, visit us online at akro-mils.com! AND STOP DUPLICATING EFFORTS! ARE YOU SPENDING HOURS UPDATING YOUR EQUIPMENT ON MULTIPLE SITES? Use HTML Stock List Tool and embed inventory in your own website. P Mirror your listed equipment on your own homepage. Bottom Line one of these members when you have questions of problems to deal with how can you not improve your bottom line and cash flow. There are NO competitors in a group. Not allowed. So, you can freely discuss your problems. That is Phase 2……you can get a lot out of Phase 1 approach, but going over your goals and results on a quarterly basis knowing 15 other folks are going to question your results and what you are doing kind of puts Phase 2 at the front of the class if you have any urgency in righting the ship. There is a Phase 3…. which I don’t have time for this month. Kind of a middle of the road approach where you can stay put and get some outside help. We’ll get to it next month. Garry Bartecki is a CPA MBA with GB Financial Services LLC. E-mail editorial@mhwmag.com to contact Garry. P No need to manually update your homepage every time stock changes. Should I hire this person? Nothing can derail decision making like conflicting data. Have you ever read online reviews for restaurants when planning a vacation itinerary? You get 12 people saying Uncle Frank’s BBQ is the best they’ve ever had, while 8 others claim it’s the worst. The 12 advocates report that Uncle Frank’s Memphis-style ribs are tender and flavorful. The 8 naysayers insist the ribs are dry, chewy, and bland. years’ experience doing the work. However, he didn’t interview well. The other applicant only has 1.5 years’ experience but clicked with the interviewers and seems like a good culture fit. So you end up saying, “To heck with it,” and go to the national-chain restaurant because at least you know what to expect there. Selection and hiring can be a bit like choosing a restaurant, but the stakes (no pun intended) are a lot higher. If a restaurant turns out to be mediocre, it’s not a tragedy; you only had to eat there that one time. But when a new hire is mediocre, you’re reliving it every day for the next six months or five years. Well, one advantage hiring managers have that restaurant patrons do not is the option of running a pre-employment assessment. An assessment that is validated for selection, such as the Caliper Profile, will show you the things you can’t see on a resume or in an interview: the intrinsic motivations, limitations, and behavioral tendencies of job applicants. This is often the additional data point needed to make that hiring choice with confidence. The hiring manager is rendered indecisive by the conflicting inputs. She personally liked the second candidate, but there’s no denying the first candidate’s proven skill set. What to do? Human Element intrinsic potential of prospective workers. The next statement is obvious: skills can be taught and potential cannot. But more to the point, skills fall out of favor when business priorities shift and technology changes. Learned skills today might not be relevant 3 or 5 years from now when the person who was hired is up for promotion or moves to a different department. Meanwhile, intrinsic motivations like Active Listening, Collaboration and Teamwork, Relationship Building, and Creativity and Innovation not only help a person succeed in a given role, they are beneficial to the company now and for as long as the person is under its employ. Furthermore, by bringing in people who are wired to exhibit the on-the-job behaviors you want to see across the organization, you can reshape the company culture for the better. That’s so much more powerful and meaningful than 5 years of experience plugging away at one task or another. About Caliper - For nearly half a century, Caliper has been helping companies achieve peak performance by advising them on hiring the right people, managing individuals most effectively and developing productive teams. The accuracy, objectivity and depth of our consulting approach enable us to provide solutions that work for over 25,000 companies. To find out more about how Caliper can help you identify and develop people who can lead your organization to peak performance, please visit us at www.calipercorp.com or call them at 609-524-1200. Email editorial@mhwmag.com to contact Caliper. None of this means that the person with more experience won’t also be the better candidate from a psychometric perspective. You may find out, after looking at the assessment report, that the less-experienced person also lacks the intrinsic motivations you want now and in the future. You might discover that, although the experienced person did not interview particularly well, he shows the performance drivers needed to deliver the desired work result over time. Conversely, it’s possible that the less-experienced applicant’s motivators align better with the job. The point is that having your applicants complete a behavior-based pre-employment assessment like the Caliper Profile will provide the objective data you can’t get from resumes or interviews. Assessment results also show a wide-angle view that considers the entire employee lifecycle, not simply what candidate brings today in learned skills. And it gives hiring managers the confidence needed to answer a fundamental question: Should I hire this person? It’s not the company. It’s the people in the company. It’s you! When you walk into someone's place of business to shop or buy something, what are you expecting? Most people (you included and me included) expect someone friendly, someone helpful when you need them, to be served in a timely manner, to be given fair value, to be presented with a quality product, to make the process quick and easy, and to be thanked whether you give them the business or not. Then the question is: What do you get? Typically, you get a mechanical welcome, someone feebly says, "can I help you?" Followed by people telling you what they can't do versus what they can do, or what they don't have. Maybe a bunch of sentences containing the word policy, and an inability to understand that just because they're out of an item, doesn't mean you don't still want it or need it, and will likely go to their competition to get it. All this, and a touch of rudeness. Now, maybe I have exaggerated a bit. But I can promise you, not by much. And the interesting part is, many companies have multiple locations where the products are the same, but the service is not recognizable from place to place -one may be fantastic, while the other may be pathetic. The inconsistency of people-performance can make or break a business. Here is what will make you or anyone near you, or anyone in a job they consider beneath them, or anyone who hates work, understand the formula for emerging into a better career -- certainly a better job. 5. Your commitment to being your best. 6. Your boss and how your boss treats you. 7. L  ooking at your job as menial rather than a steppingstone towards your career. It's not "just a job" - it's "an opportunity." 8. Pride in your own success. 9. R  ealizing that you're are on display, and that your present actions will dictate your future success. 9.5 Every today is a window to your every tomorrow. Companies spend millions, sometimes billions of dollars in advertising, branding, merchandising, strategizing, and every other element of marketing that they believe will bring business success. But if there are people involved, marketing means nothing if the people are not great. When I walk into a business, I ask people, "How's it going?" I get the most disappointing answers like, "Just three hours to go." Or, "It's Friday." What kind of statement is that? What does that tell you about what kind of employee they are, much less what kind of service is attached to their attitude? When you go to a hotel, a fifty-million-dollar business rests on the shoulders of shoulders of the front desk clerk. That's the first impression you have. In a retail business, it's no different. 1. Y  our internal happiness. Happiness is not a job, it's a person. All the advertising gets you to come into the store. From there, it's all about the retail clerk. Doctors and dentists now advertise. But it's the person who answers the phone that gives a true reflection of what the doctor or dentist office will be like. 2. Y  our attitude toward work. Do you just go to pass the time for a paycheck, or are you there to earn your pay with hard work? What is your company like? Do you have any people working there that hate their job? Do you have people with "attitude?" What can you do? 4. Your desire to serve. Sales Trends 2. Hang around with the winners, not the whiners 3. C  reate service best practices, and have everyone implement them. 4. Have weekly internal positive attitude training. 5. L  ook at the best companies in America for best practices you can adapt and adopt. 6. Do your best at everything, every day. 6.5 W  ork on your own attitude. You must think you will succeed, before success is yours. You must think you will be happy, before happiness is yours. The root word of "your" is YOU. Each employee has the responsibility of representing their company to their customers in a way that reflects the image and reputation needed to build or maintain a great reputation and a leadership position. Develop the pride in doing your best at your job even if it's not your career, and never use the word "just" when you describe yourself. Real winners are few and far between. And making yourself one is a choice. Jeffrey Gitomer is the author of twelve best-selling books including The Sales Bible, The Little Red Book of Selling, and The Little Gold Book of Yes! Attitude. His real-world ideas and content are also available as online courses at www.GitomerLearningAcademy.com. For information about training and seminars visit www.Gitomer.com or email Jeffrey at editorial@mhwmag.com. Anything less than "best" is not acceptable. But here's the secret: Don't do it for your company -- do it for yourself. B  ig River Equipment Company, Inc. B  urke Handling Systems, Inc. C  ontinental Lift Truck, Inc. E  mpire Forklift, Inc. E  quipment Depot Ltd. – Texas E  rie Industrial Trucks, Inc. F  orklifts of Minnesota, Inc. F  orklifts of St. Louis, Inc. Fraza G  authier Chariots Elévatéurs J.M. Equipment Company, Inc. L  ift Parts Service, LLC M  aterial Handling, Inc. M  S Equipment Sales, Inc. N  ational Lift of Arkansas, Inc. S ilver State Forklift, Inc. T  he Lilly Company T  ri-Lift NC, Inc. W  elch Equipment Company, Inc. Nuts & Bolts Acquisitions, expansions & other business news Terex to sell Demag® Mobile Cranes business Terex Corporation has announced that it has agreed to sell its Demag® Mobile Cranes business to Tadano Ltd. for an enterprise value of approximately $215 million. The Demag® Mobile Cranes business manufactures and sells all terrain cranes and large crawler cranes. Included in the transaction are the manufacturing facilities in Zweibrucken, Germany and multiple sales and service locations. The sale, which is subject to government regulatory approvals and other customary closing conditions, is targeted to close in mid-2019. Zielsdorf name president of Lift Products, Inc.
Matt Zielsdorf has been named President of Lift Products Inc., Derco Manufacturing, and Solution Dynamics, all three companies are owned by Material Handling Holdings. Matt has 25 years of experience in sales leadership in the capital equipment industries. He spent 16 years with Peerless Food Equipment located in Sidney, Ohio in various management roles and ending his time at the company as Vice President of Sales and Marketing. Before arriving at Lift Products Inc., Derco Manufacturing, and Solution Dynamics, Matt served as Vice President of Sales and Marketing at Apache Stainless Equipment Corp. in Beaver Dam, Wisconsin. Custom Equipment, LLC welcomed industry veteran Terry Dolan as its president and CEO. Dolan brings nearly 30 years of experience in the rental, construction and equipment industries and will lead the overall direction and strategy of the organization. He has more than 20 years of executive and general management experience in the industrial equipment and rental sector, including leading national sales, operations and marketing teams. Nord Modules celebrates its U.S. launch with new distributor U.S. distributor Hermitage Automation is the first distributor Nord Modules has signed to take its modules into the U.S. market. According to Bruno Hansen, co-founder of Mobile Industrial Robots (MIR) the company expects to grow its distribution network extensively within the next months. At Trelleborg, our goals are maximizing uptime and accelerating your business. Our application-specific innovations, compounds, and products have been designed to help meet those goals. always choosing safety, performance, and productivity. Whatever the application, we have the solution for you. Thombert DYALON® “B” wheels and tires have been the industry work horse for electric lift trucks since 1958. DYALON® “B” is the only 83 Shore A durometer on the market today. It offers good load capacity, traction, and durability all rolled into a single compound. Enjoy life rather than think about your wheels and tires. › Up to 50% less rolling resistance compared to competition. › As much as 9% reduction in energy costs along with a significantly reduced carbon footprint. › Up to 50% lower running temperature compared to competition. › Reduced running temperature equals less tread wear and greater retention of load capacity. › Excellent wear and chunk resistance. › Little to no difference in performance of non-marking tires as compared to standard black tires. › Highly elastic, shock absorbing rubber. › Advanced engineered non-marking tire. › Excellent ride comfort and stability. › In many applications end users note Continental Solid Tires last up to twice the life of our competitors’ tires. ClearCap & TuffCab! ClearCap Roof Covers! Shorter Lead-time. Greater Capacity. Better Service. We have grown from 22,000 sq. ft. to more than 70,000 sq. ft. on 12 acres. Our new Missouri manufacturing facility with our state-of-the-art equipment and powder coat paint line allows us to expand capacity by 4 times. Repair and protect all types of pallet rack. All Styles, All Punches, All Dimensionsâ&#x20AC;Ś Mac Rak has your repair and protection solution! Best Distributor Support Service in the industry! At MVP, we pride ourselves on providing outstanding quality, drop-in replacement parts. We don’t use phrases like “close enough” or “will ﬁt.” Our staff scrutinizes over parts before we add them, making sure that we can be proud to put our name on each one. The extra investment and commitment to quality means your customers will get a part that will ﬁt and perform just as the original did -- making you look like the expert! For over 20 years, equipment dealers and service centers have trusted MVP with their business. You, too, can count on MVP’s PROVEN, quality and performance to make your customers happier and your job easier! At MVP, You’re the Most Valuable Person! The Hyster Tracker mobile app offers a new level of productivity. It works as a companion to the existing Hyster Tracker desktop portal, bringing data-driven insights and management functionality to the warehouse floor for easier, more efficient fleet management. The Hyster Tracker mobile app provides near-real time fleet utilization metrics and notifications when events like impacts or errors on pre-shift safety checklists occur. Smart dashboards make large data sets and information more manageable via smartphones, eliminating the need to get to a laptop or work station for critical information and site analysis. Marking its entry into the 12,000-pound capacity market. The Pettibone Traverse model becomes part of the industry’s only new telehandler product line with a traversing boom carriage that can move loads by traveling horizontally. By providing up to 70 inches of horizontal boom transfer, the Traverse allows operators to safely place loads at full lift height without needing to coordinate multiple boom functions. The new telehandler is powered by a 117-horsepower Cummins QSF 3.8 Tier 4 Final diesel engine that helps the machine achieve its maximum load capacity of 12,000 pounds. Visit our website to learn more about reducing carbon monoxide (CO), saving fuel and operating equipment at peak performance. DON'T MISS OUT ON QUALITY LEADS. ADVERTISE HERE IN THE SOURCE DIRECTORY FOR $67 PER MONTH! 877.638.6190 TO GET INTO THE NEXT ISSUE. Materials Handling Solutions for Your Industry Combilift, leaders in providing innovative material handling solutions including Sideloaders, 4-Way Forklifts and Straddle Carriers offer products designed to handle long and oversized loads better than anyone else, guaranteeing considerable improvements in space utilization and safety. With capacities ranging from 3,200 to over 180,000lbs, it’s a safe choice to go with Combilift. Featuring 360° steering and a multi-functional joystick allowing smooth seamless motion and change of direction, in addition to full control of all the hydraulic functions. This contributes to faster procedures and safety for manufacturing, distribution and logistics operations. In ONE DAY 65 million selfies are taken.